Erin Donohue was born May 8, 1983 in Philadelphia and grew up in Haddonfield, New Jersey. An multitalented athlete with great speed and endurance, Erin eventually found her niche as a teenager in middle-distance running events. At Haddonfield Memorial High School, she was practically unbeatable as a junior and senior, winning back-to-back national mile prep titles in 2000 and 2001. During her time with the Bulldawgs, Erin competed in field events, too, including the javelin. She set a record by winning all but one of the 16 track and field state group titles in which she competed. She also captured 9 Meet of Champions titles, including two cross country championships. In her final race as a high schooler, Erin broke the state record for the mile with a time of 4:42.96. Erin attended the University of North Carolina on an athletic scholarship. During her four years running for the Tar Heels she was recognized as an All-American 8 times for her performance indoors, outdoors and in cross country, and was named All-ACC in each of her four varsity seasons. As a sophomore in 2003, she helped set an American record for the indoor distance medley relay as the UNC won the NCAA title in that event. Erin was also a four-time Academic All-American. After college, Erin signed a deal with Nike and continued to compete as a member of the New Jersey New York Track Club under coach Frank Gagliano. 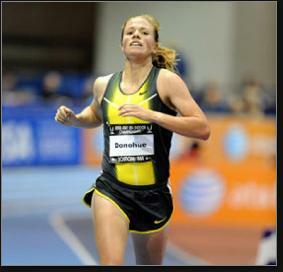 In 2006, she won the Olympic Development Mile at the Penn Relays and the 800 meters at the Tuppeny Twilight. In 2007, she recorded the fastest time in the 1,500 meters of any American woman—and also won a bronze medal in the 1,500 meters at the USA Outdoor Track and Field Championships in Indianapolis. That secured a spot on Team USA at the IAAF World Championships in Japan. One high point of Erin’s career was making the 2008 Olympic team. She competed in the 1,500 meters in Beijing. She finished 8th in the preliminary heat, falling 1.5 seconds short of earning a berth in the finals. Her friend and foe, Shannon Rowbury, was the only U.S. runner to make the cut; she finished seventh in the finals. Erin had a solid season in 2010, at age 27. She was a silver medalist at the USA Outdoor Track & Field Championships in Iowa, barely losing out to Anna Pearce in the 1500 meters, and finished third in the 5th Avenue Mile in New York. She now coaches cross country runners as an assistant at Philadelphia University.